Raccoon stealing cat food with the cat making a wise choice. Oreo a rescue kitten. She is now an adult and never did grow very big. 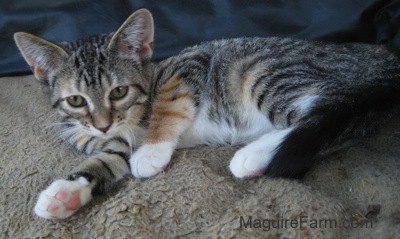 She still looks like a kitten even though she is full grown. Bruno the Boxer with Oreo the cat. Notice Kung Fu Kitty in the other bed behind them. All of the cats love Bruno. Kung Fu Kitty all grown up. 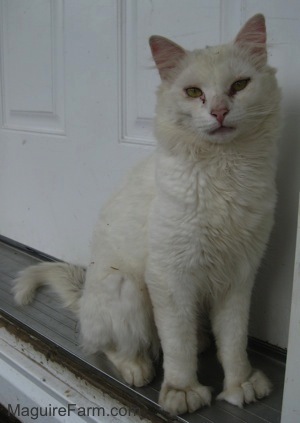 Shown here in his summer coat. His coat grows longer in the winter. 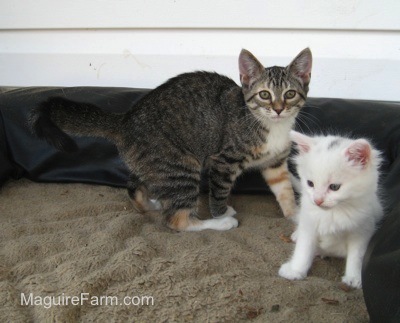 Misty, shown here at 13 weeks old, is a female tabby, and Kung Fu Kitty, shown here at 5 weeks old, is a white, male Polydactyl cat, which means he has an extra toe. 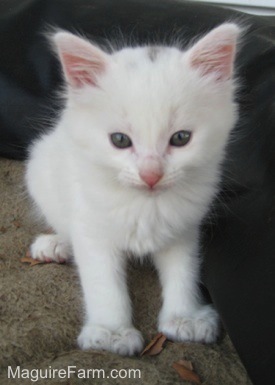 Kung Fu Kitty, the Polydactyl cat at 5 weeks old. 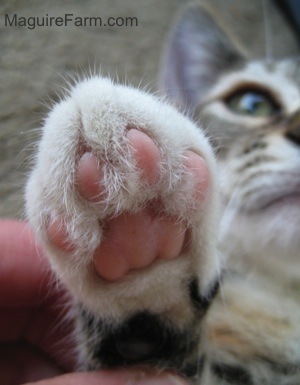 Kung Fu Kitty's extra toes. Instead of having 4 toes on each foot, his two front feet have 5 toes. This is Misty's foot. Compare Kung Fu's foot to Misty's foot. Misty has a normal cat foot. 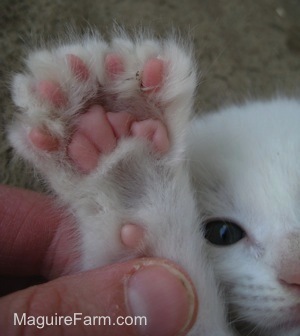 The picture above this one shows the extra toes. 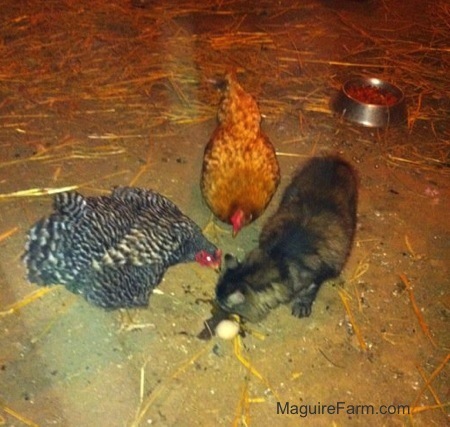 As Maggie got older she took up residence with the chickens. 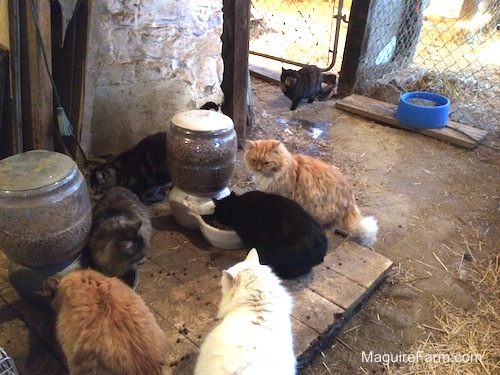 Want to go see Maggie, you have to trek down to the chicken coop. Shown here sharing a raw egg with them. The chickens are not afraid of Maggie and Maggie is not afraid of them. The chickens are often seen putting her in her place. If a chicken wants the food it will tell Maggie to back off by pecking at her and she gives them their way. More time than not however, they just share. Simba, Maggie, Miny, Midnight the 5th and Waffle at 5 weeks old. Miny at 5 weeks old. Waffle, Midnight 5th, Simba, Maggie and Miny at 2 months old. Kitty Land - Kittens at 2 months old.